Working in food service, mowing lawns and baby-sitting have long been go-to jobs for teenagers, and while each has the potential to teach work ethic and responsibility, many local teens are taking a different approach to building their resumes. 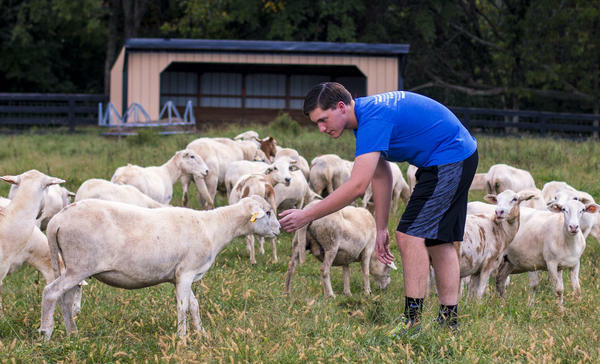 Nelson County High School student Larkin Williams approaches some of his sheep at his family farm in Bloomfield. Williams has been raising and selling the animals since middle school. Katye Berry raises chickens and sells eggs through her business, Berry Eggcellent Eggs. At 14, Kruse Harned realized three things: He needed a job, he wasn’t keen on mowing grass and he had access to fresh produce that people might be interested in buying. So, making use of the lawnmower by hooking up a wagon, Harned launched a produce delivery service. “It’s called Freshie’s Produce,” Harned said, and the business is a partnership with his dad, who owns Bud’s Produce, a wholesale produce distribution center in Elizabethtown. “I buy the produce from him for what he would normally sell it and then I sell to people in my neighborhood,” Harned explained. Harned would hand out flyers around his neighborhood advertising the products that could be ordered and after orders were turned in and prepped, he would deliver them to his neighbor’s homes. The Bethlehem High School student has taken a break from the business this year as he focuses on school, but Harned said he is looking to start up again in the future. Harned is not alone in his entrepreneurial endeavors. Katye Berry, a Nelson County High School senior, runs Berry Eggcellent Eggs as part of her supervised agriculture experience project for FFA. She joined the club as a freshman. “I have almost 85 chickens, so I have laying hens, roosters and pullets,” Berry said. She sells the pullets she has hatched, along with the eggs she collects. “I’ve used the local radio station to advertise, Facebook” and word-of-mouth through her friends, family and locals, she said. Berry said she hopes to expand and add chickens to her inventory. She would like to eventually open her own breeding house to sell purebred chicks and produce enough to sell to local stores. 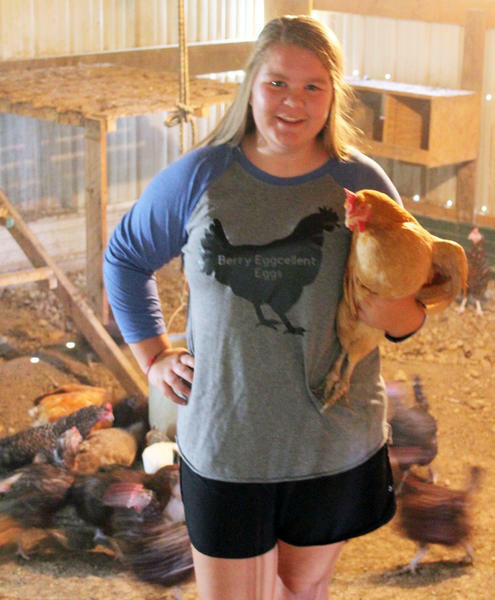 The egg business is a passion of Berry’s, but as a high school senior, she has college plans as well. “I actually want to go to UK and major in biosystems engineering,” she said, but she plans to keep the chicken and egg business up and running. Like Berry, Larkin Williams’ business is agriculture related. The 17-year-old has been raising sheep since he was in the seventh grade, and he currently has 29 adult sheep and around 35 lambs. “I usually sell to local buyers, but lately, I’ve been trying to market my sheep to bigger breeders,” he said. “I went to Oklahoma to acquire some ewes the year before last,” he said. “Now, I’ve been making higher breeding stocks,” and has rams he is looking to sell next year at a national gathering. Williams said the inspiration for his sheep business came from his older brother, Martin, who was just starting FFA at the time. “He was a freshman, and he started raising cows,” Williams said. With plans to also join the agriculture club, he wanted a head start. A great-uncle had raised sheep, and, with the help of his family, Williams decided to buy a few of his own to get started. “You’ve got to be ready for that, be prepared and know how to overcome the challenges you face,” he said. The money Williams earns from his sheep — which is about $200 per head depending on the size and age of the animal — is going toward college, and he also plans to study engineering after high school. His sheep business will likely downsize when he heads off to school, but he hopes to pick back up later. While the U.S. Bureau of Labor Statistics indicates that most working teens will find employment in restaurants or retail shops before they graduate high school, these local kids have demonstrated its never too early to start building a business, even from their own backyards. While Harned, Berry and Williams have built their own businesses, other local teens have used family businesses to earn experience. Clay Cecil, a Thomas Nelson High School student, has been helping out with his family’s greenhouse, Foxtail Farm, since he was in elementary school. He’s been responsible at times for calculating what products are bringing in the most profit and demand. “It helped me figure out I like working on the financial side of things and it has helped prepare me for what I want to do,” Cecil said, explaining that he would like to study accounting or financial advising after he graduates. Also taking an interest in finances is Will Rapier, a Bardstown High School student. Rapier’s father is the owner of Kenny’s Cleaners in Bardstown and Rapier has worked with him off and on in his adolescent years. “I’ve really learned that customers come first,” and the relationships you build with people are important, he said. But while working with his dad has taught him about customer service, it’s his uncle, Rob Smotherman, who has been a huge influence on him in terms of his career choice. Smotherman works as a financial advisor for Edward Jones investment firm, and Rapier has, in a way, shadowed him in recent years to learn more about his work. “It’s just so intricate, I found it amazing,” he said. When Rapier was just starting middle school, he remembers being out with his uncle one day when he started talking about the stock market, which intrigued him. Now, having the chance to learn a little more, Rapier has plans to attend college and pursue a business degree with an interest in stocks. For Hunter Roby, the work he does outside of school is less about learning finances and more about moving his way up in the family company. Roby, 16, of Cox’s Creek, washes and polishes vehicles for Ashbaugh & Roby Trucking. “I’ve always been around trucks,” he said, with his parent’s starting the business in the 1990s. Keeping the trucks clean not only gives him something to do, he said, but it has also taught him responsibility. “I’ve always been taught to keep everything clean and to take care of your stuff,” he said. But the cleaning side of the business is just a stepping stone. Roby hopes to eventually become a driver for the company and possibly take over one day.